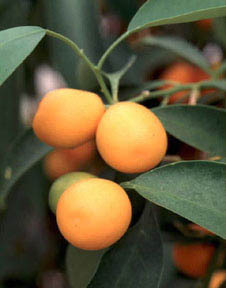 The kumquats or cumquats are a group of small fruit-bearing trees. The edible fruit (which is also called kumquat) is similar to other Citrus but is smaller. Kumquats are slow-growing, evergreen shrubs or small trees, from 2.5–4.5 m tall, with dense branches. Sometimes they have small thorns. The leaves are dark glossy green, and the flowers pure white, similar to citrus flowers. Kumquats came from China (they are known in literature of the 12th century), and have long been cultivated there and in Japan. They were introduced to Europe in 1846 by Robert Fortune, who was collector for the London Horticultural Society, and a short time later into North America. They are much hardier than citrus plants as oranges. The 'Nagami' kumquat needs a hot summer, ranging from 25 °C(77°F) to 38°C(100.4°F), but can withstand frost down to about -10 °C(14°F). It grows in the tea regions of China where the climate is too cold for other citrus fruits, even the Mikan (also known as the Satsuma) orange. The English name "kumquat" derives from the Cantonese pronunciation gam1 gwat1 (given in Jyutping romanization). The alternate name 柑橘, also pronounced gam1 gwat1 in Cantonese (gān jú in Mandarin, literally "large tangerine orange") is now more commonly written by Cantonese speakers. Burkill, I. H. (1931). An enumeration of the species of Paramignya, Atalantia and Citrus, found in Malaya. Gard. Bull. Straits Settlem. 5: 212–220. Mabberley, D. J. (1998). Australian Citreae with notes on other Aurantioideae (Rutaceae). Telopea 7 (4): 333-344. Available online (pdf). This page was last changed on 20 June 2018, at 09:18.